Our Azure-based cloud solutions overcome the challenges and hidden costs of managing a cloud environment to support increased productivity and long-term success. Atmosera, a premier Tier-I Microsoft Cloud Solution Provider (CSP), today announced the company’s Three Tier Azure Management Suite to strategically align Atmosera managed service levels with business objectives, expertise, and their existing IT investment. A leading provider for the cloud enablement of business applications, Atmosera now provides co-managed and self-managed Azure solutions in addition to its fully managed solution suite. Atmosera provides these options via a customer’s existing Enterprise Agreement (EA) or via the Atmosera CSP licensing format. The new portfolio offers customers diversity of choice for the oversight and management of compute, storage, networking, security, support, and engineering relative to a wide range of cloud-based IT solutions powered by Azure. Microsoft’s constantly-expanding worldwide network of data centers is the foundation behind Azure, the cloud platform for hosting applications on-demand. Atmosera provides the infrastructure and intelligence to support organizations in cloud-enabling their IT operations on Azure through the company’s managed, co-managed, or self-managed models leveraging Azure’s Infrastructure-as-a-Service (IaaS) or more frequently, Platform-as-a-Service (PaaS) functionalities. Atmosera’s Three-Tier Azure Management portfolio empowers IT with a powerful, reliable, and secure set of computing alternatives for deploying a vast array of computing workloads. Fully Managed Solutions: Customers beneﬁt from having a cloud solution provider who supports and manages IaaS and PaaS services through the OS layer and, optionally, to the middleware and database layers. Co-Managed Solutions: Customers select the services they want to perform on their own and which ones will be handled by Atmosera. This creates a split responsibility matrix with defined, automated runbooks which allow the customer to retain as much or as little control as they require. 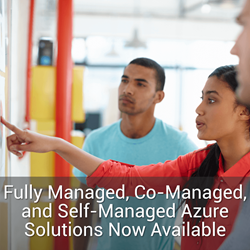 Self-Managed Solutions: For self-managed Azure services, enterprise IT staff provides 24x7x365 oversight to operate their compute, network and storage resources. With this approach, Atmosera is responsible for infrastructure availability. The management of the OS, middleware and database is overseen by the customer. The Atmosera three-tier Azure management suite introduces customized levels of outsourced IT support for organizations seeking to lower operational costs, reduce risk, improve system reliability, and rest assured that skilled experts will operate as a trusted extension of their team. Atmosera provides greater flexibility with these service levels to reduce the extensive resource requirements of IT, allowing customers to focus on the core areas of their business. With over 20 years of industry experience, Atmosera is a leading provider of business-class Microsoft cloud managed services. Award-winning Atmosera Managed Azure Services simplify the process of transitioning from legacy three-tier IT architecture to the Microsoft Cloud Platform for improved IT transparency, security, and trust. Atmosera is a 100% focused on Microsoft and is a Gold Level Tier 1 CSP with Microsoft COSN and Azure Certified for Hybrid designations. With hundreds of customers worldwide, Atmosera service capabilities span the globe and reach across every business sector. To learn more about Atmosera Managed Azure Services, please visit https://www.atmosera.com/managed-azure/ or call +1.800.903.4852.